Chinos, joggers and cargo pants have all made their respective plays for pride of place in our rotations, but jeans are still the go-to, go-anywhere coverings for most men’s getaway sticks. For all but the most formal of offices and life events, denim is a no-brainer. You can’t go wrong. Can you? Oh, you can. You really can. And one of the most face plant-precipitating stumbling blocks is selecting footwear with entirely the wrong DNA for the jeans in question. Wear them with too-smart shoes, and you’ll look like you’re going to a bad nightclub. Wear them with flip-flops, and you’ll look confused, at best. Those are just two ends of a broad misstepping spectrum. Matching shoes with jeans needn’t be an unnavigable minefield. You just have to follow the right directions. This is the FashionBeans guide to what pairs go with what, well, pairs. The function of jeans has shifted since they were invented, or at least patented, in 1873. These days, the closest that many of us get to manual labour is hammering a keyboard. But wherever they sit on the broad denim formality spectrum, jeans are fundamentally still workwear: practical, utilitarian, not smart. So even though you might wear leather shoes to work, there’s a strong risk of incongruity between, say, a sleek, polished Oxford and rugged selvedge. You could perhaps pull off Oxfords with smart jeans: slim, black and worn with no turn-ups (which break up the streamline and thus have a casualising effect, as they do on tailoring.) But Derbies, which generally feature a chunkier profile, are a better bet for counterbalancing denim. Black Derbies in particular though are still towards the smart end of the even broader shoe formality spectrum, so could look a bit muddled with mid-blue jeans: you’d almost be safer going to the stonewashed, distressed extreme to dial up the subculture overtones. They’re considerably more formal than the trainers that most of us schlep around in given the option, but brogues are nevertheless a relatively casual smart shoe, if that isn’t a contradiction in terms, originally designed for farmers to yomp through muddy fields. That’s why they’re generally more suited to tweedy rural weddings than sharp urban nuptials, and business-casual rather than corporate boardroom. As a general rule, sleek, minimally detailed brogues will skew more formal; chunky, hole-punched ones will skew more casual. Colour is another factor that affects which jeans your brogues will or won’t work with, going from black at the formal end and getting gradually lighter towards the other. After a failsafe combination? While relatively casual tan brogues are unsuitable for smart navy tailoring – please stop doing this – they pair pleasingly with smart-casual indigo denim. Bonus points if the shoes’ shade picks out the jeans’ stitching. Unless you try really hard, it’s almost impossible to put a foot wrong with minimalist sneakers. Sleek, low-profile styles go with pretty much any variety of jeans except, that is, for the rightly maligned bootcut. If really committed to tripping up, then silhouette is where you can come a cropper. This is typically more of a concern with lighter canvas styles that can be deficient in the heft required to counterbalance heavy-duty jeans, whether straight- or wide-legged. Conversely, the combination of long, thin high-tops and skinny or tapered jeans can make big feet look positively clownish. With white trainers, the main consideration – assuming that you want to incorporate them into more formal ‘fits is keeping them clean. (The same applies to all shoes, but it’s less noticeable with non-white pairs that didn’t start out that colour.) Pass the stain protector. Another style that looks money with most anything, including denim: penny loafers are an adaptable Ivy League staple that has even found a new currency among sneakerhead streetwear fans. Tread carefully, mind. The penny loafers’ low vamp (that’s the section of upper that covers the front of the foot) combined with a wide leg opening can make your feet look weirdly stubby. So opt for jeans that are tapered and cropped or pinrolled. Monk straps burnt brightly during the social media-driven ‘hashtag menswear’ phase of the mid- to late-naughties then seemingly out. However, they’re still a solid footwear option, combining some of the formality of an Oxford with swashbuckling dash. Indeed, the hardware lends them a certain casual quality that coordinates well with riveted denim. Again, silhouette and colour are the principal considerations. There’s something inherently right and faintly Italianate about a mid-brown dub-monk with a mid-to-light blue pair of jeans: close your eyes, and you could almost be stunting for a street style photographer at Pitti Uomo. Suffice to say the now established principles of silhouette (chunky is more casual than sleek), colour (tan is more casual than brown is more casual than black) and texture (suede is more casual than leather) all apply here. It’s worth pointing out that black leather Chelsea boots with a sleek profile can skew almost as formal as Oxfords, and therefore risk jarring with straight-legged (and -laced) indigo denim. Turn it up to eleven with some black or grey skinnies though, and suddenly you’re in a band. The kicker with Chelsea boots is the heel: if it’s stacked like Bruno Mars’ bodyguard, then that vertiginous preciousness will only really harmonise with the kind of tight denim that helps you hit those high notes. On the other foot, a crepe sole takes some of the dainty edge off, making them more tonally appropriate with distressed jeans. You saved up the cash, queued around the block, and finally you’ve got your hands on the latest drop. So it seems a shame to cover your high-tops up with your kecks. The answer is obvious: don’t. Assuming you don’t want to buy shorter jeans just for days when you might hit the b-ball court, or hem an existing pair (professionally, or with a pair of scissors if you’re into that frayed look), simply roll them to just above the top of your sneaks. Never more than twice, though, otherwise the resulting thickness will kill your vibe altogether. As in tailoring, the more of it you have (waistcoat, top hat etc. ), the more formal. The reverse is also true, the less of it, the – guess what? – less formal. Suede desert boots, in particular, feature softer uppers and sole than other footwear styles, but they’re still rugged. Unsurprising for footwear worn by British soldiers in North Africa in WWII. Able to take a kicking, and look better for it, they can be worn with everything from shorts to suits in the right circumstances, but almost always ally well with jeans, smart or casual. Because of their versatility, there’s no real hard-and-fast rule, but rolling them up to flash some covered ankle is strongly encouraged. Although thanks to the ebb and flow of trends it’s possible to buy refined versions for exorbitant prices, work or hiking boots naturally fall into the casual lumberjack camp. For that reason, it makes sense to play up the workwear origins of your jeans, whether indigo or faded, in a way that suggests you’ve done a day’s work in your life. Chunky boots also provide ballast for wider-legged denim; overly slim or skinny jeans on the other hand will contrast too harshly, which may well be your desired effect, but won’t fool anyone into thinking that you’re genuinely handy or outdoorsy. Also, unless you’re going for the skinny-stacked look, your jeans will need to be on the shorter side, or rolled up: if you want to exude maximum vintage vibes, try a single oversized cuff. 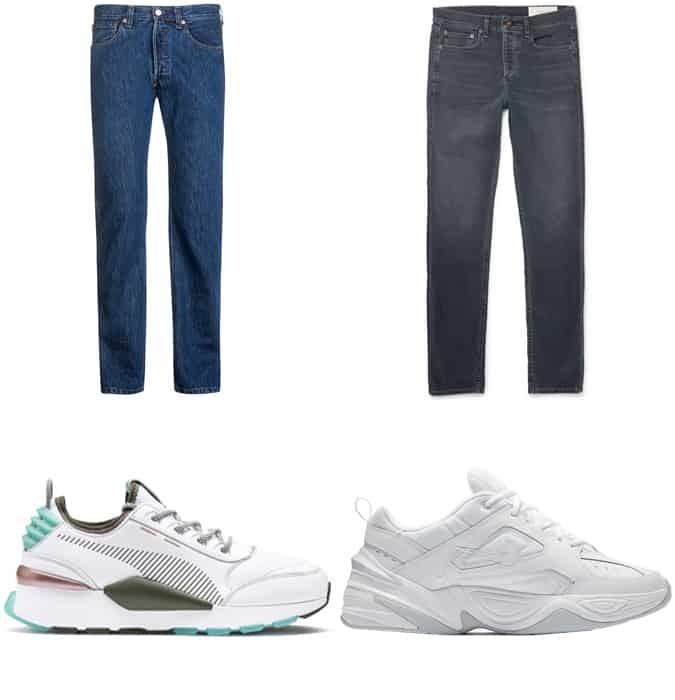 The unlikely resurgence of dad trainers (if they were ever cool) has been in conjunction with a similar shift in denim, which their chunkiness complements. So why break from the normcore? To finish the DILF look — that’s dad’s in latest fashions, in case you were wondering — opt for the type of jeans you grew up watching your old man wash the car in. That’s straighter, wider and with a higher-rise, preferably in stonewash. Daddy cool. With a frankly alarming number of years' experience under his waistband, he's equally comfortable dispensing advice about classic style or high fashion, Swiss watches or fitness and nutrition - because he's probably wearing (tailored) sweatpants while he does so.